It’s only early summer, but before we know it the dog days of August will be upon us. Want something spectacular to view while you sip lemonade or a whiskey sour in the shade? Consider planting a climbing vine—there are lots of varieties, and no, these are nothing like your grandmother’s ivy. These vertical dazzlers bring color and charm to your yard. 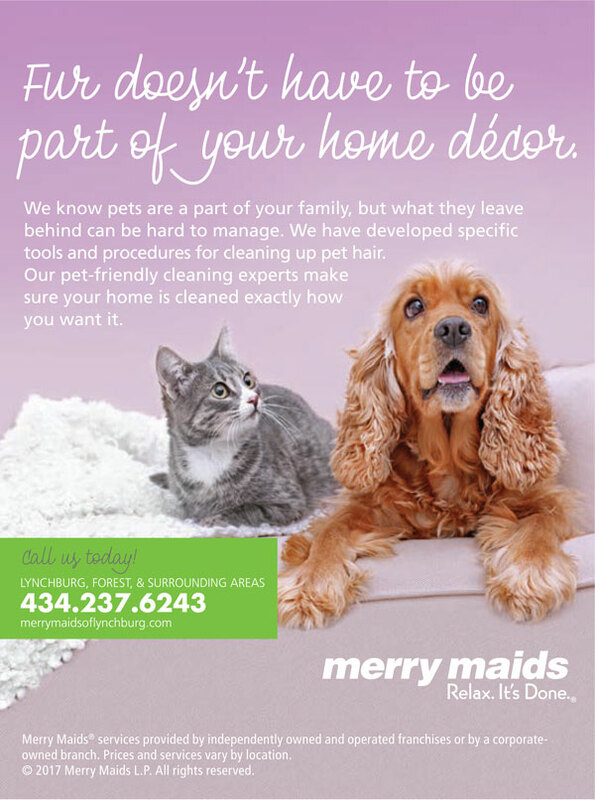 Look around and find an area in your yard that lacks interest. Planting something colorful or with fascinating leaves will catch everyone’s attention. It might be that bare brick wall on the side of your garage or your house—a large empty space like this is a great place to install a trellis for these plants to climb. Is there a shed in the backyard that could be more attractive with just the right planting? A plain spot along a garden path? This is a great place to install a trellis or archway as an entry to another part of your garden. Do you have a bare fence or wall? These structures, too, make great sites for climbing vines. Once you locate a spot, you must decide what type of plant (shade-or sun-lover) will grow there. To do this, watch the sun pattern over the next few days, and think about the other color in that area. What color would complement the surrounding plants? You may choose to keep it all one color for a serene look, or choose a climbing vine with vibrant color that calls attention to this spot. Texture is another consideration. 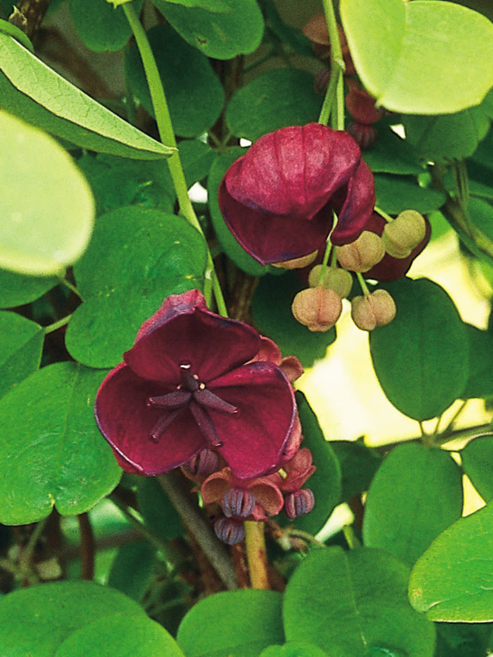 Select a vine that either berries, flowers or hosts unusual leaves to create a real accent. Once you know your plant specifications, you will be able to find the perfect vine. To train your vine to grow upward, you will need to tie it on to a trellis, fence or latticework with string. Another option, if you are comfortable with a little do-it-yourself project and use a slow-growing, non-invasive plant, is to create a wire grid for the plant to grow on. To do this, attach small eyehooks into your brick, siding or stucco wall and connect them with wire. On a flat wall, the trellis design can be any pattern that suits your space. Draw it on paper first to decide if you want a square or a diamond grid. Measure the space and mark with a pencil the places where you want your anchor points. Make the grid by using a mason drill to form small holes where each of your pencil points are marked, fill the drilled holes with anchors, and screw eyehooks into the anchors. Start at the top and run the wire between the hooks to create the wire grid. Alternately, you can buy a wooden trellis kit at the garden store. Plant your vine according to the grower’s tag instructions. Be sure to leave room for the plant to grow and for your wall or other structure to “breathe.” Attach loose strands to the trellis or grid to train the vine’s ascent upward and outward. If you want to add more depth to the vignette, place a small garden statue in front of it. Or consider putting a birdbath in front of the vine, providing another dimension and offering birds a cool spot to land. Flowering vines come in many types, so it should be easy to find one that enhances your garden and grows well in our climate. Traditional vines that work well here include clematis, climbing roses and honeysuckle. Clematis comes in vibrant colors—pinks, purples, reds, yellows, and blues, as well as shades of white (and black, called “Midnight in the Garden of Good and Evil”)—and the flower petals and stamen are miniature works of art. Some look like pieces of candy dangling from a leafy green vine. 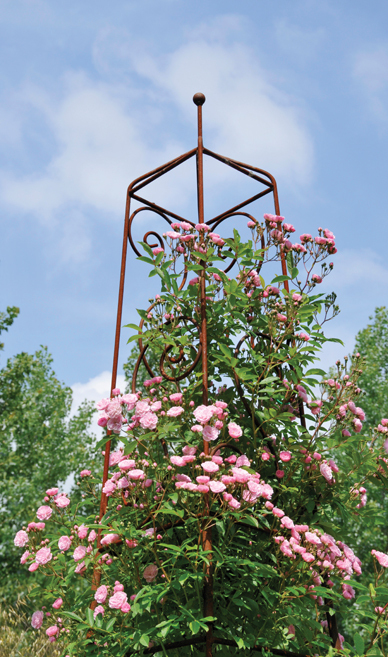 Climbing roses offer beautiful colors and shapes. Some even stray from the traditional look of a rose, with ruffled-edged petals or tiny flowers that look like clusters of buttons from a distance. Climbing roses look stunning ascending up a bare wall of a garage or garden shed. They like lots of sun and their colorful petals contrast with the thorny green stalk that supports them. And honeysuckle vines smell divine and bring to mind memories of summer days. Their flowers are smaller dots of color, but there are so many on the vine that they give a textured look when they climb up a wall. There is a lot of color and pattern to see, and when the wind blows, you get whiffs of their deep perfume. 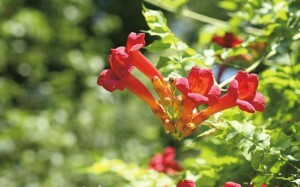 Honeysuckle comes in reds, whites and yellows, and lends that traditional southern look to a yard. If you are looking for something a little more unusual, consider a chocolate vine, jessamine or climbing hydrangea. Chocolate vine features sweet-smelling lilac flowers, and the vine produces edible fruit that tastes like tapioca pudding. Chocolate vine is known for this oblong blue fruit that makes wonderful jams and preserves. Jessamine vine is easy to grow, and flowers abound on its glossy, green-leafed stems. 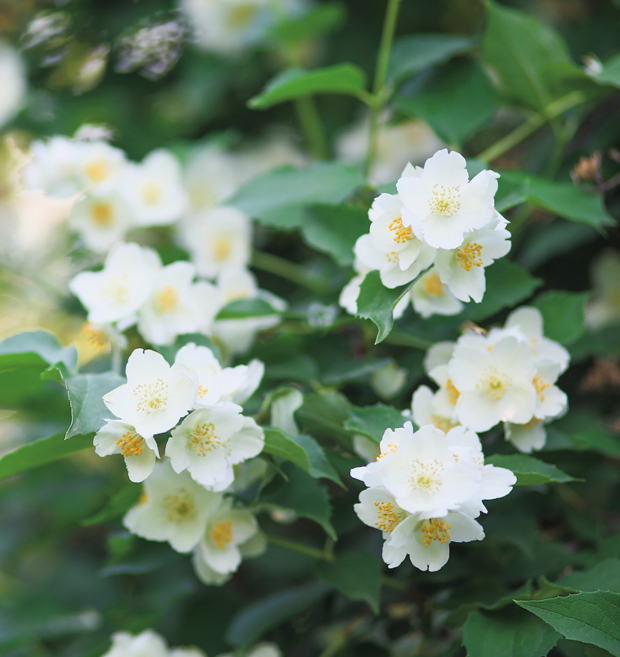 A beautiful southern vine, jessamine grows well on fences and trellises, spreading a coat of yellow when it flowers each spring. The “Yellow” or “Carolina” varieties are likely the hardiest for our zone. They produce fragrant flowers and will grow unsupported if you choose to let them mound in your garden rather than train them on a trellis or fence. Climbing hydrangeas are simple, serene vines that take a little more care, but the rewards are worth it when those flowers bloom. Climbing hydrangea need extra protection during extremely cold winters until they are well established in your garden. They come in several shades of pink as well as a beautiful white with deep green leaves. One variety offers a textured bark that peels in the winter to keep your garden interesting all year long. Vines with a little more edge include trumpet and wisteria vines, which catch your eye with their prolific, colorful flowers. Trumpet vines call attention with their long, bright orange flowers; hummingbirds love them too, bringing active nature to your yard. They grow aggressively, and can fill in a bare spot quickly, so if you are not interested in pruning, you might want to choose a different plant. 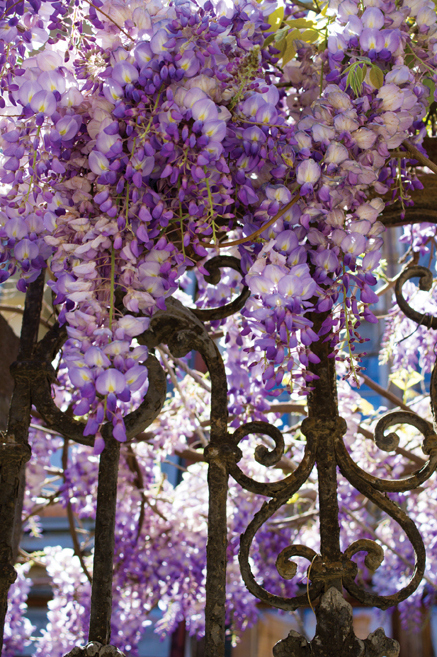 Wisteria evokes wistful sighs, with its dangling purple clumps and twisting vines. 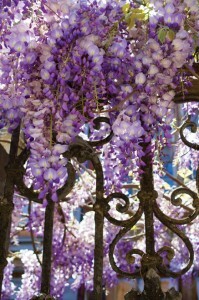 It requires patience and shears as it climbs quickly and sends runners to create little wisteria. It also requires a strong trellis for support. Climbing vines give so much to your yard by growing up and out, pulling the eye in a different direction than your old faithful garden beds. Paired with big pots or sculptures on the ground, your vine can be part of a garden vignette, camouflaging spots that are otherwise barren or unattractive. And they are so much fun to watch as they grow and change over the years. It’s time to try one and see what a splash they make in your yard this summer.